So many beautiful streets in Paris! The Champs-Élysées at night is my favourite of all. So romantic and the buzz – so exciting! Beautiful! Paris looks like a dream, silent, peaceful vacation. The culture is inspiring. I’ve been to most of these streets and totally agree with you! Paris is so pretty! Love this post! I’ve stayed on Rue Cler – truly a beautiful area! These photos just make me feel like I should drop everything and move to Paris… or is that just me? This post just made my desire to go to Paris even bigger! How can something be so inspiring & beautiful like this city is? paris is the dream place to visit. I love Paris, but it is so darned touristy! And you can’t move for travel bloggers 😉 It’s like Whicker Island 🙂 hmmmmm I feel an update coming on! i love paris! these are my beloved streets there. so pretty! All of these streets are so pretty ! I think I’ve strolled along most of them, except rue Crémieux. I definitely need to find that one- it’s so colourful! Paris, wow Paris! It’s definetly always the best idea! Beautiful selection, there are so many charming streets, it’s hard to make a selection. You did a great job on covering all of the best streets on Paris. I’ll be using this as a guide when I visit France. Just watched your Stockholm vlog on YouTube, added that to my list too. Rue Bonaparte for sure! 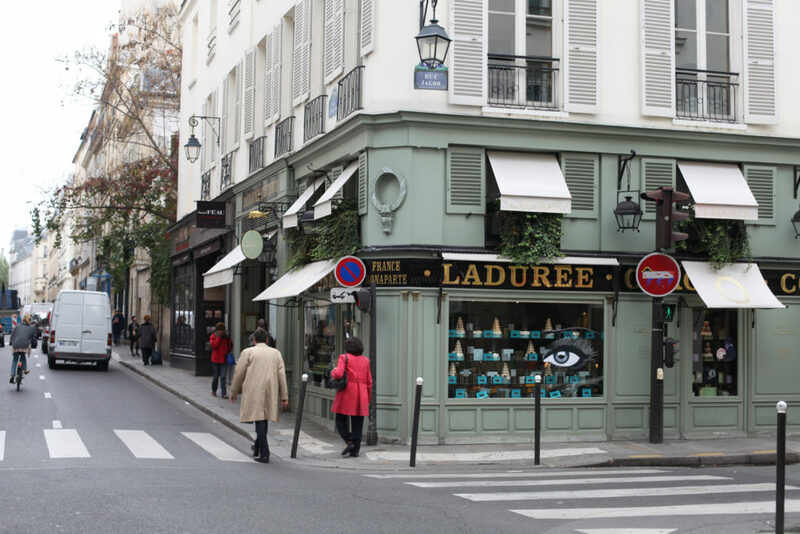 I remember asking a local where to find Laduree, and I guess my French accent wasn’t too great, because it took forever for him to understand me! Turns out, I was pronouncing macaron wrong: macaROON instead of macuhrun! Ahhhh I’d love to visit Paris one day, I was so close to visiting last year but then the terrible bombings took place. I hope I’ll have the chance to visit again! Such beautiful architecture and a glorious atmosphere! Gorgeous! I haven’t been to Paris yet…so much to see when I finally get there. Aw these streets are so pretty!